I went to college nine hours away from home — easily doable in a day’s drive, but tedious nonetheless. On one trip through the cornfields of Indiana, I remember turning to my friend wondering why we hadn’t figured out cruise control for steering wheels. I had already been cruising at a steady 70 m.p.h. for hours with my feet on the floor. Why did I have to touch the steering wheel to keep it in the lines too? Less than six years later, the answer is that I don’t have to touch the steering wheel anymore. Self-driving cars are here, and they’re arriving faster than many predicted. The pace at which a self-driving car went from myth to reality has caused all sorts of problems, from a talent shortage in the field to a sudden arms race in trying to build the best self-driving car on the market. Uber’s CEO Travis Kalanick called it „existential“ for the company to develop its own driverless car technology. Yet, there’s still a large distinction — and years of development — between the self-driving cars hitting the streets today and the driverless cars that we dream of in the future. 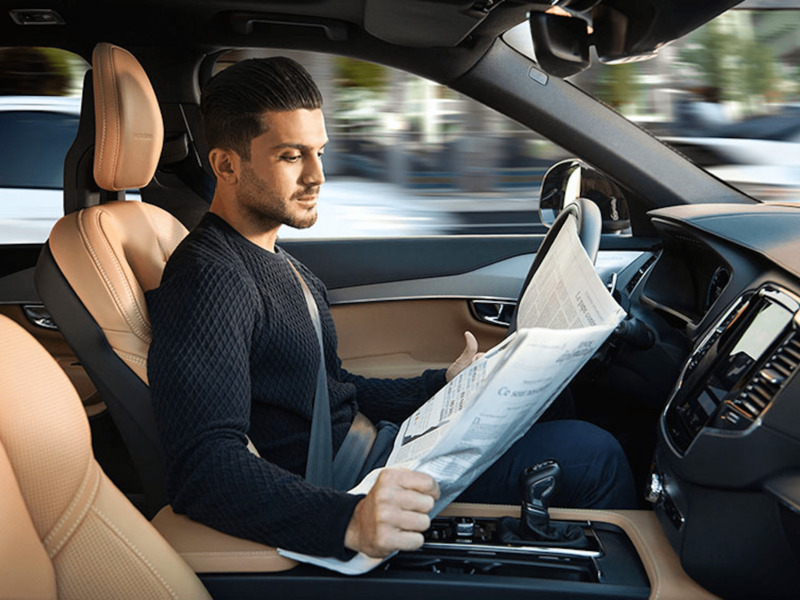 Most „driverless“ cars today still have a driver in the front seat. Teaching a car how to drive itself (even with a driver on hand) is just the important first step. It’s hard not to be seduced by the images of driverless cars. Mercedes-Benz‘ concept car shows four seats all turned to face each other. 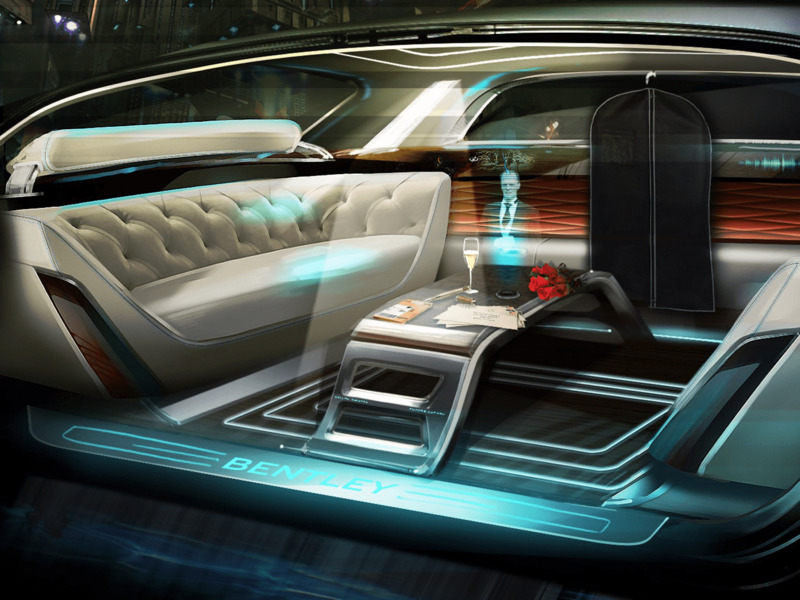 Bentley’s driverless dream comes with a holographic butler — a future staple for the high-end autonomous car. The Rolls-Royce has a two person couch with a giant TV where the driver normally sits. Even Larry Page is rumored to be working on a flying car so we all finally get one step closer to“The Jetsons“ future we’ve envisioned. However, what’s not acknowledged is just how hard it is to get cars to that point. When I asked Uber’s Kalanick just what’s holding truly driverless cars back, he laughed because there’s just so much — and a lot of it just that the technology hasn’t even been developed. A self-driving car shouldn’t freak out at a four-way intersection or turn off every time it goes over a bridge. To get in a self-driving car today, it feels like having cruise control, but for the whole car. The autopilot keeps the car’s speed steady, it stays evenly inside the lines, and maintains the proper following distance. The only way to experience a self-driving car is to either own a Tesla or live in Pittsburgh and magically hail a self-driving Uber. After taking a ride in Otto’s self-driving truck, I explained the experience to my 92-year-old grandmother as being in a plane: You have a licensed driver who does take off and landing, or in this case, getting onto the interstate, but then once it’s clear, you just set it to autopilot. While having „self-driving cars“ in the hands in the public is a huge milestone, it’s just the beginning in the path to full autonomy. Truly driverless cars remain years away — but still closer than you think. 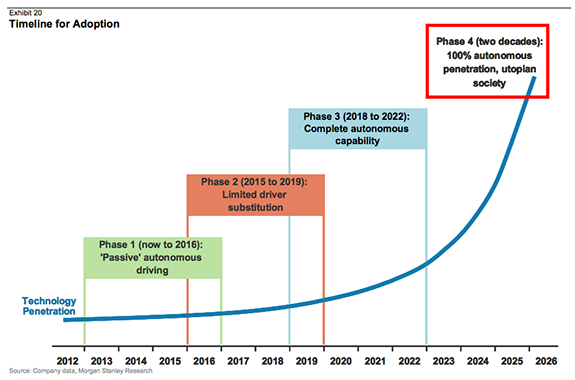 Ford, for example, plans to roll out its first fully autonomous carsfor ride-sharing by 2021. Google is aiming for 2020 , and Tesla is planning to make its vehicles part of car-sharing networkonce its cars are fully autonomous. The impacts of that will be widely felt. Merrill Lynch predicted in a 2015 report that driverless taxis like Ubers will make up 43% of new car sales by 2040. The Boston Consulting Group also wrote in a 2015 report that driverless taxi sales are bound to incline. The BCG predicts that 23% of global new car sales will come from driverless taxis by 2040, which will result in a decline in vehicle ownership in cities. Before we get to driverless though, we need to perfect self-driving. To do that, that means putting real self-driving cars to the roads in a test. That’s why they are here and happening now. Driverless will come next. Dieser Eintrag wurde veröffentlicht in Artificial Intelligence, e-mobility und getaggt mit autonomous drive, autonomous driving am 23. September 2016 von innovation. 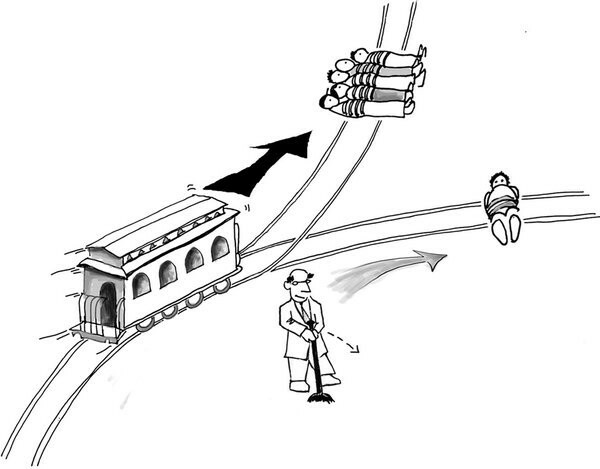 Dieser Eintrag wurde veröffentlicht in e-mobility, Innovation und getaggt mit adoption rate, autonomous, autonomous drive, google+, Morgan Stanley, trolley problem am 28. Mai 2015 von innovation.